Faye Glenn Abdellah was born on March 13, 1919. Abdellah was the first nurse officer to earn the ranking of a two-star rear admiral. 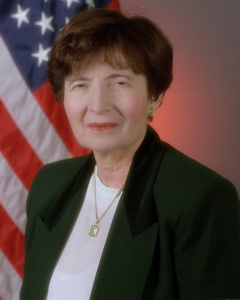 She was the first nurse and the first woman to serve as a Deputy Surgeon General. Her work changed the focus of nursing from disease-centered to patient-centered, and began to include the care of families and the elderly in nursing care. The Patient Assessment of Care Evaluation developed by Abdellah is now the standard used in the United States. Her publications include Better Nursing Care Through Nursing Research and Patient-Centered Approaches to Nursing. She also developed educational materials in many areas of public health, including AIDS, hospice care, and drug addiction. She was inducted into the National Women's Hall of Fame in 2000. Learn to know the patient. Sort out relevant and significant data. Make generalizations about available data in relation to similar nursing problems presented by other patients. Test generalizations with the patient and make additional generalizations. Validate the patient's conclusions about his nursing problems. Continue to observe and evaluate the patient over a period of time to identify any attitudes and clues affecting his or her behavior. Explore the patient and his or her family's reactions to the therapeutic plan and involve them in the plan. Identify how the nurses feel about the patient's nursing problems. Discuss and develop a comprehensive nursing care plan. The model identifies nursing as a helping profession. Nursing care is doing something to or for a patient, or providing information to the patient with the intention of meeting needs, increasing self-ability, or alleviating impairment. In other words, helping patients become more healthy. Abdellah describes health as a state mutually exclusive of illness. There is no definition of health given by her in the theory, but she speaks to "total health needs" and "a healthy state of mind and body" in her description of nursing as a comprehensive service. The nursing process in Abdellah's Twenty-One Nursing Problems theory is: assessment, nursing diagnosis, planning, implementation, and evaluation. In the assessment phase, nursing problems provide guidelines for the collection of data. A principle underlying the problem-solving approach is that for each identified problem, pertinent data is collected. The overt or covert nature of problems necessitates a direct or indirect approach, respectively. The results of the collection of data in the assessment phase determine the patient's specific problems, which can be grouped under one or more of the broader nursing problems. This creates the nursing diagnosis. The statement of nursing problems most closely resembles goal statements. Using the goals in the framework, a nursing care plan is developed and appropriate nursing interventions are determined. Putting those interventions in action is the implementation phase of the nursing process. After the interventions have been carried out, the evaluation takes place. The most appropriate evaluation would be the nurses progress or lack of progress toward the achievement of the goals established in the planning phase.